A great way to break free from a business trip! We booked the food tour for about 15 of us and had a great time. Downtown Carlsbad is a cute little surfing village with lots of history, restaurants, and shops. We made stops at Caldo Pomodoro for their famous garlic bread, delicious marinara, giant meatball, and artichoke dip; Humble Olive Oils for their flavored oils and vinegars; Viggiluci’s Gourmet Market for the most amazing fresh made pasta in vodka sauce and lots of treats available from Italy; Witch Creek Winery for a wine tasting and for those who didn’t want wine, there was delicious coffee (I got the nitro pour cold brew- delish! ); Gregorio’s Italian Restaurant had awesome eggplant sliders; Sub Zero Ice Cream was a real treat, frozen with Nitrogen and boy does it deliver on flavor! We had to skip Senor Grubby’s pork tacos because we were on a time crunch, but the last stop was the Carlsbad Chocoalate Bar and it did not disappoint. Cheri did a great job keeping the group moving, teaching them all about the history of the village, and you could tell she and her step-daughter enjoyed it thoroughly! We also were able to stop in some of the shops and enjoy the graffiti artwork that changes periodically. Everyone had a great time and there was truly something for every appetite! Thanks again from all of at the Laboratory Products Association! 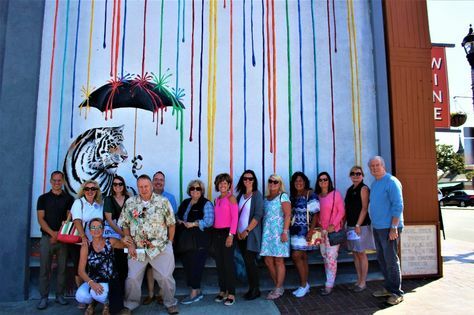 If you are looking to schedule your team building event, contact us at www.carlsbadfoodtours.com or call us at 760 215-9433, we would love to host your team building event.